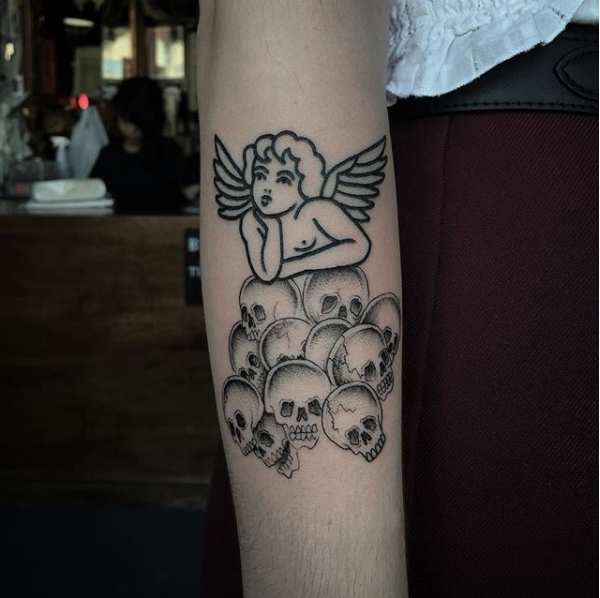 Tessa El Maleh’s monochromatic, figural tattooing adopts a synthetic approach to tradition. Born in Pittsburgh in 1993, Tessa spent her youth in a Maryland suburb outside of Washington, DC. “Both my parents work in science, as does my younger sister. 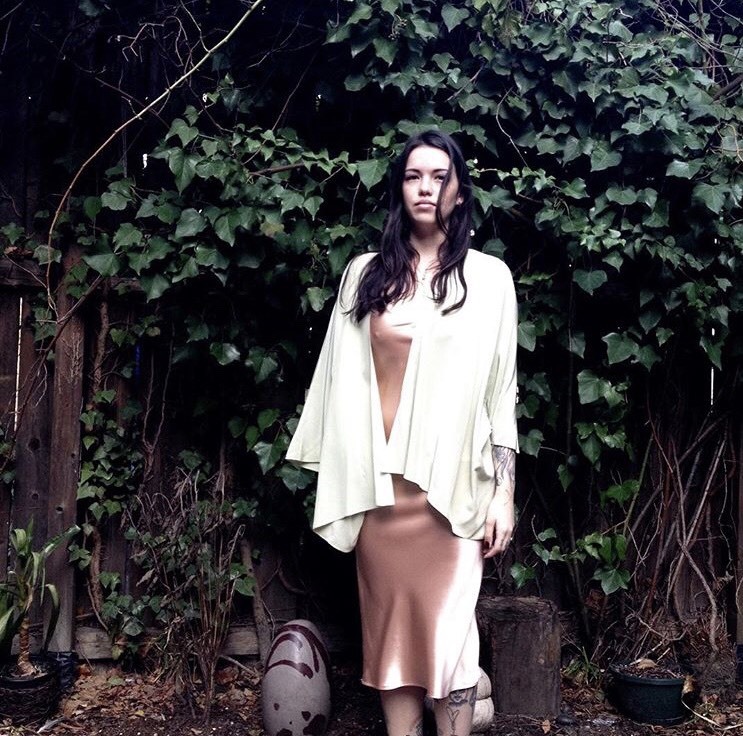 I am definitely the token black sheep of the family.” In the interview that follows, Tessa discusses her origins as a tattooer, her struggle to live in New York City while maintaining an apprenticeship, and her many sources of inspiration. 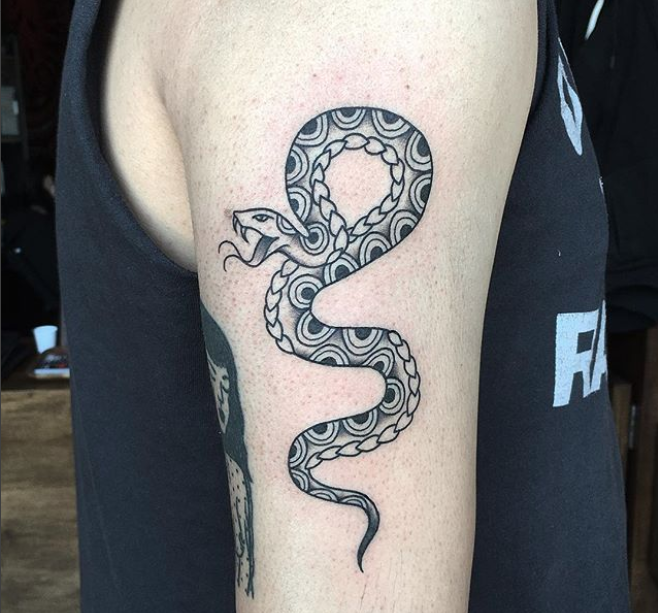 I work at Magic Cobra Tattoo Society in Brooklyn, New York. Prior to that, I was tattooing at Gnostic Tattoo in Bushwick, Brooklyn. Before my apprenticeship, I worked in a few tattoo shops around the city, working at the front desk and observing as much as I could. 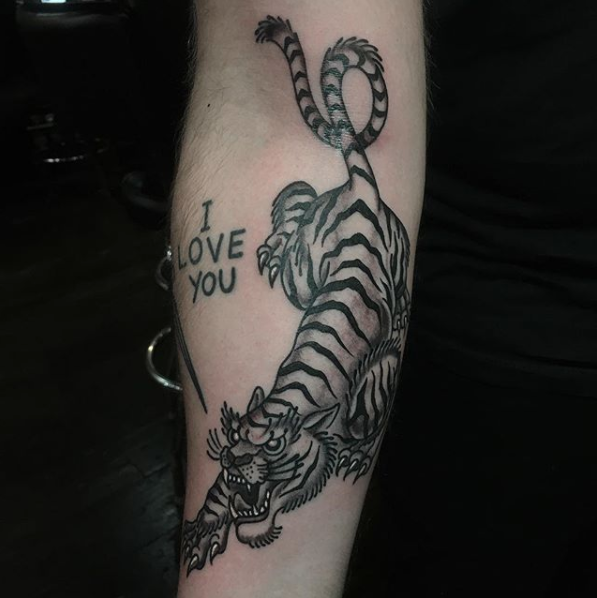 I have been tattooing for about three years. All I was have ever had an interest in is making art, and it’s the only thing I have cared about since I was a child. I was never really connected to the idea of pursuing a career in fine art—although for a while I was working towards that because I didn’t think I had any other appealing career choices that involved art-making. 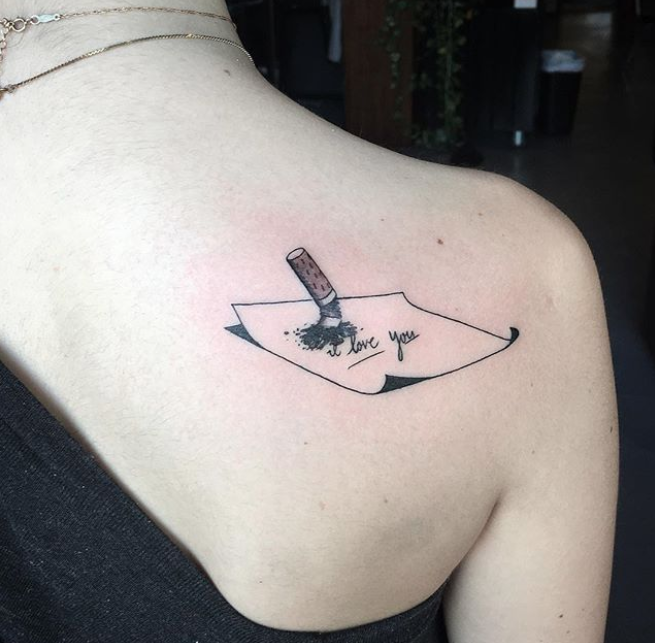 What inspired me to learn to tattoo was definitely the experience of getting my first tattoo, in which I immediately fell in love with the work environment: social, creative, and revolving around a craft that is as ancient as it is modern. 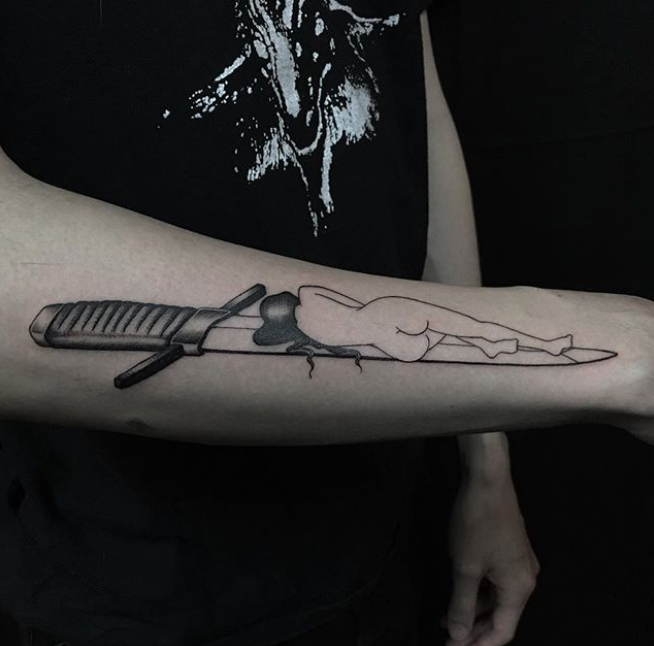 Since it took some time for me to find an apprenticeship, the scope of my initial understanding of tattooing was quite broad and sometimes misguided, but I was drawn most to traditional Japanese tattooing. 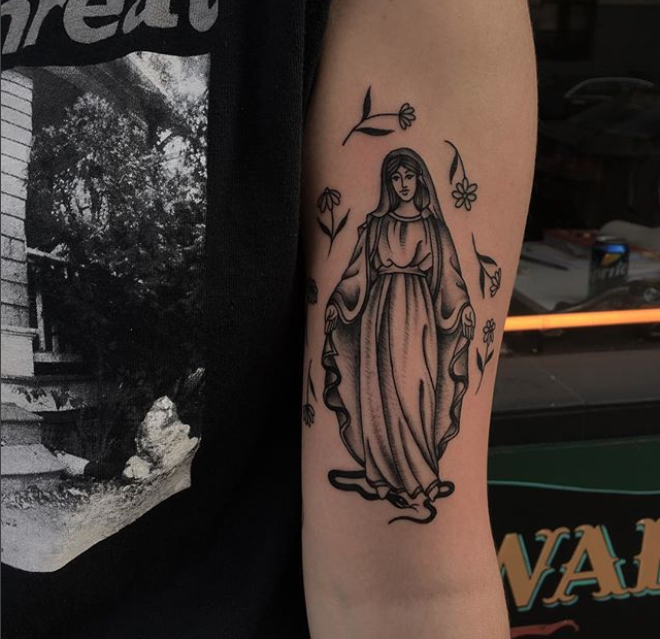 After around two years of learning about the industry and trying to find someone who would take me on as an apprentice, by sheer luck and happenstance I met Leaf Chang, who owns Gnostic Tattoo in New York. I spent a few years apprenticing, which was a true test of my mental strength and dedication to tattooing. 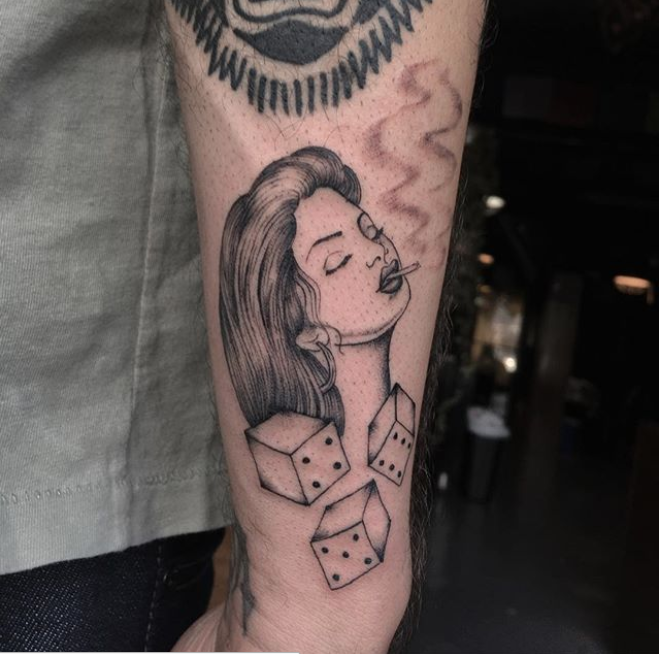 Sometimes it was difficult, especially being in New York where making money full-time is essential, and being a tattoo apprentice makes that impossible to do. Every step of the way—regardless of how challenging—was rewarding and inspiring beyond description, and continues to be because of the endless potential of the trade. 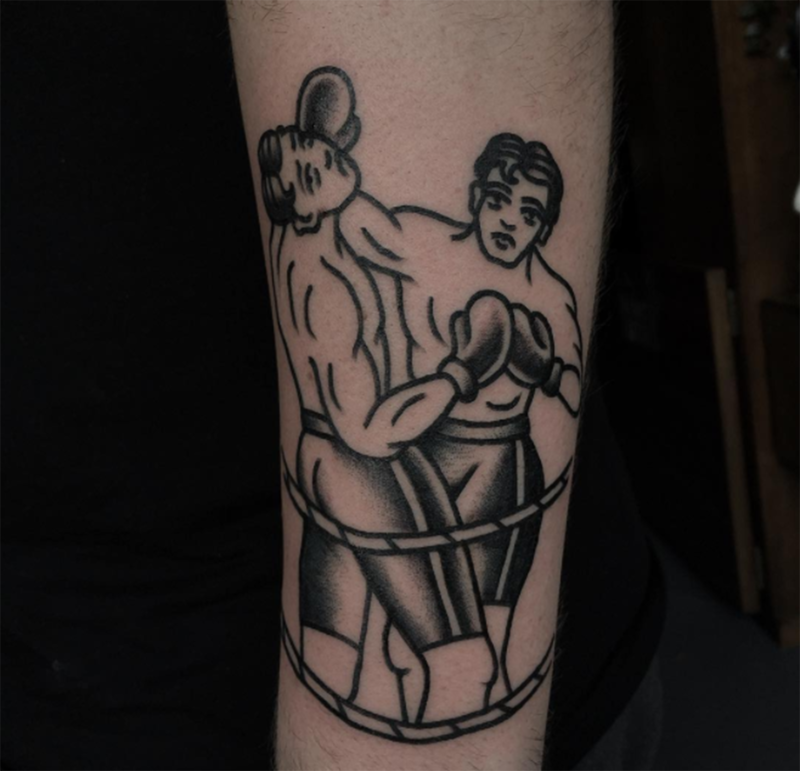 I studied fine art at NYU’s studio art program, but dropped out to pursue tattooing about a year and a half in. 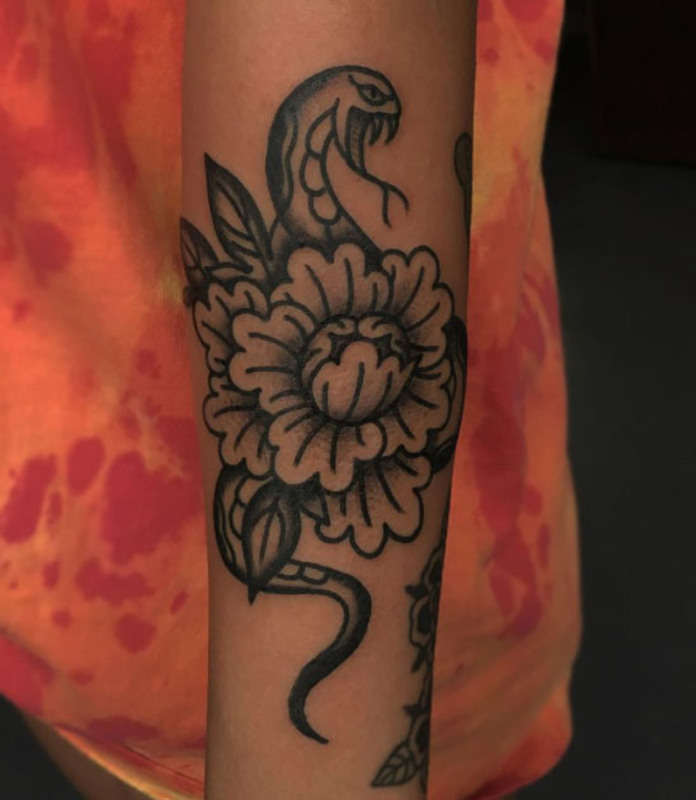 I wanted to tattoo so badly that my mind was mostly detached from school, with the exception of some writing, drawing, and color theory classes that I really loved. I had a bit of tunnel vision, and focused only on what might help me get closer to tattooing. Without a fundamental understanding of what makes a drawing or composition work, I don’t think any tattooer could be successful, so I attribute my tattooing career to what I have learned and continue to learn about art and art-making. 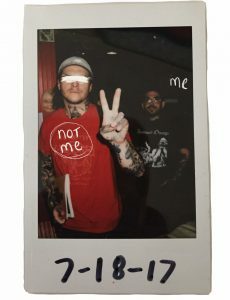 My style develops in tandem with the comfort of working with a tattoo machine—there are moments while working on a tattoo that simply feel amazing, and those moments are intoxicating. 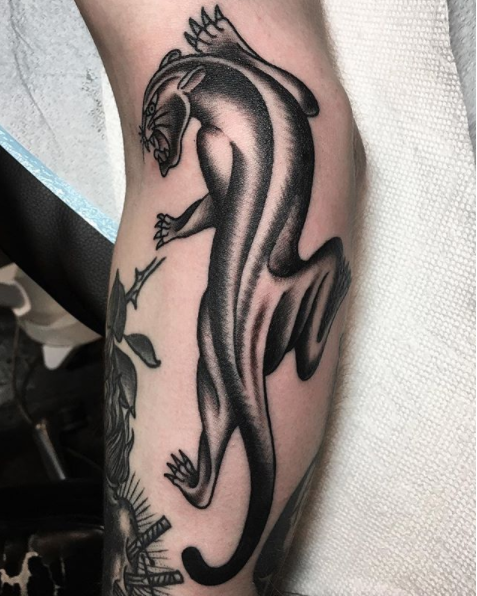 In my first year of tattooing, I tried to accommodate as many clients as possible, which helped me figure out what I enjoyed tattooing and which tattoos allowed me to progress. 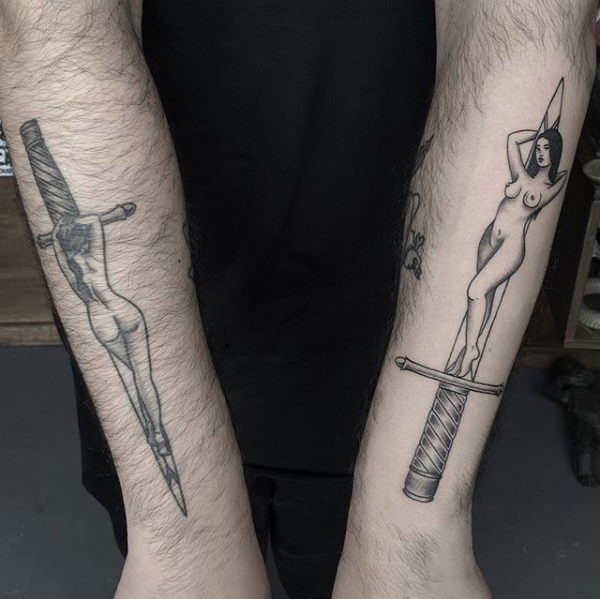 At this point, my style is heavily influenced by a combination of many traditional tattooing styles: I like to keep things timeless, and that desire is wholly influenced by traditional tattoos of varying origins. If I am lucky, here and there I gather inspiration just by things I see on the street or read in a book, too. It is far too early for me to say! I may re-evaluate my competency when I have been tattooing for enough time that I feel capable of teaching. 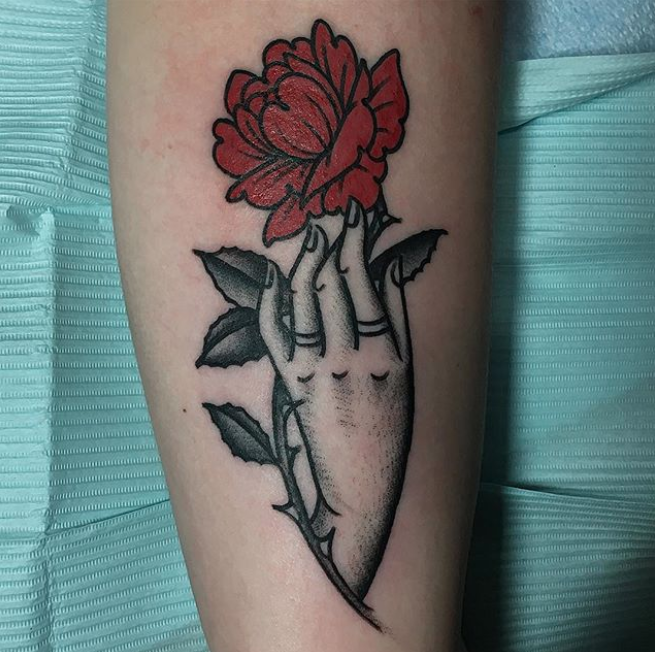 In my short career up until this point, the thing I value most in a shop is working with a group of people who care about making good tattoos and who thrive working with people who have those same goals. The best work happens when everyone is engaged and positive, so that, to me, is a necessity. Tattooing is such a fun job and I love working alongside other people who are having fun. Truth be told, I’ve gotten a dog recently so the majority of my focus outside of work these days is him. It is an obsession. I learn a lot from my dog. Other than drawing and painting, I also really love to take advantage of being in a big city—I do a lot of walking, and I see as much art and watch as many movies as possible. I am always inspired by the hustle of my friends and colleagues. The infinite potential and flux in the work and lives of the people around me really motivates me. I am extra lucky to be living in a city like New York, where there is a constant pulse of vitality and creativity. I am very critical of art, to the point where I can become consumed by the ideas and my own self-criticism. I am moved very much by film as well as painting. I am instinctively not so critical when I tattoo, which is very liberating for me, and it is what I enjoy the most about working—tattooing is such a specific experience of making, while also letting go. It is a really good exercise for my inner self-critic. I experience profound joy in appreciating the art that I am interested in, especially when it requires me to navigate my own conflicting thoughts. That is what makes it so important. I actually have yet to travel and work—which is something I am planning to do this New Year! I am super excited to travel and make friends. 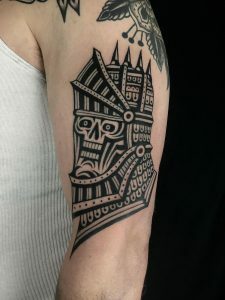 To me the biggest challenge is maintaining the responsibilities a tattooer must uphold to honor the art of tattooing and its origins, while simultaneously existing on and with the Internet. 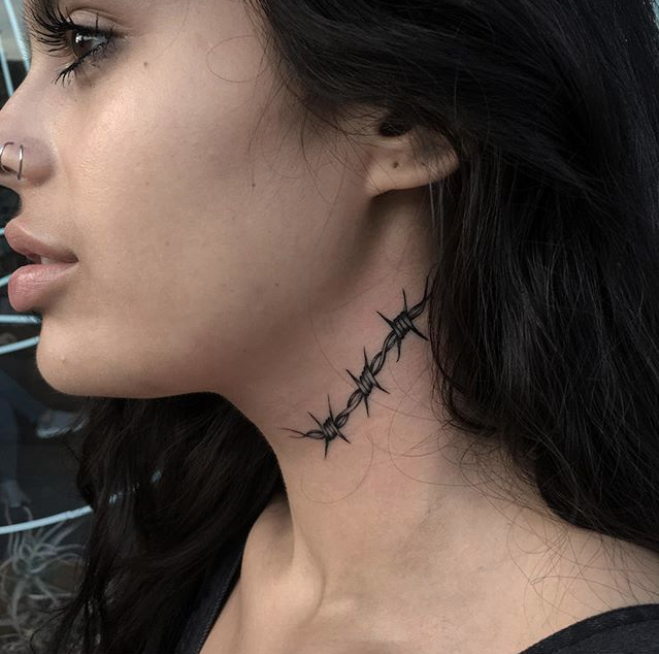 The tattoo community has a huge media presence that is extremely influential, which has its pros and cons: because tattooing is so accessible, a lot of people feel entitled to bypass the apprenticeship and the years of hard work and practice it takes to become a well-rounded tattoo artist. I think that as long as social media is part of the business, it will be hard to make sure anyone interested in tattooing will understand the value of tradition. 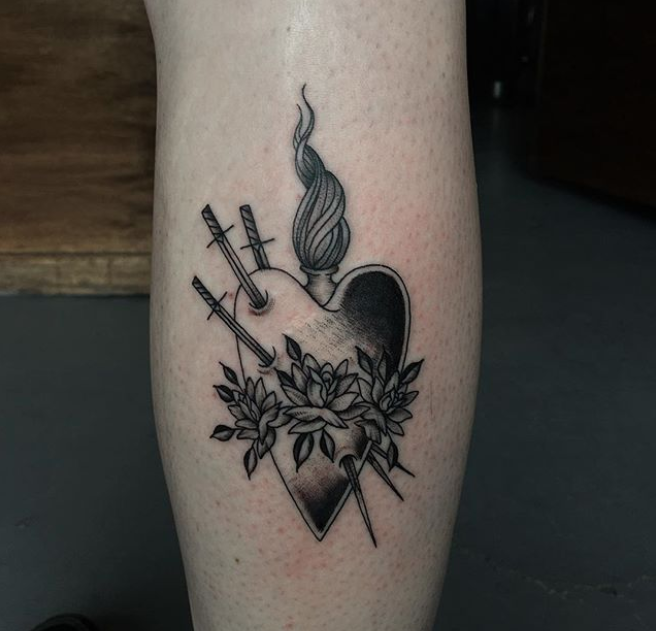 I would love for tattooers to continue making connections and being open to working with all types of people. The industry is evolving rapidly as we speak, and I think realistically the best anyone can hope for in terms of tattooing is that it remains relevant and that the mounds of talented people in the industry continue to collaborate and spread the love. 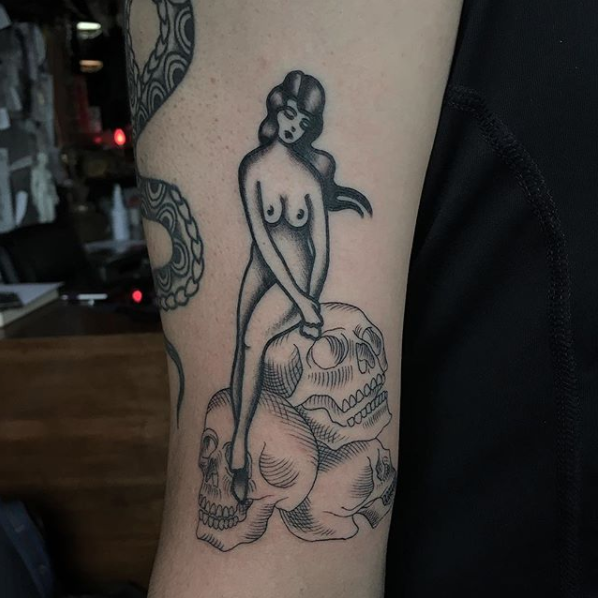 You can see more of Tessa’s work on Instagram, @tessatattoo.